Helix Jump for PC by Voodoo games is an ode to when games were simple. It is a casual game that requires high amount of concentration to perfect. 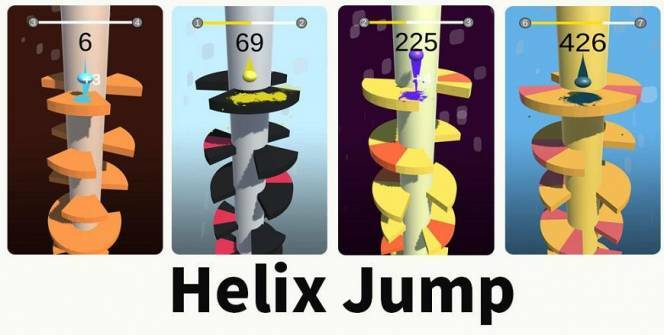 Think of Helix Jump like it’s a version of Jelly Jump where you go down instead of forwards. Mobile games were designed to be simple. The mobile game platform was not designed to give gamers detailed graphics or anything more complex than kindergarten-grade AI for the NPCs but many developers seem have to forgotten that. Thankfully, Voodoo games has provided the gaming world with a game that stays true to the limitations of mobile gaming device. The premise here is simple- all that you have to do is the get the ball all the way down to the bottom of the spiral from the top. Along the way down the spiral discs you have to get the ball to fit through the gaps in the discs. It is simple, but simple games also tend to be very difficult. Hazards are lined up along some of the discs. You must avoid them along the way or its game over and back to the top of the spiral. The game gets more difficult the farther down you go, with hazards taking up large sections of the spiral’s platforms. You can boost your score along the way by falling through three or more gaps at the same time. The disc that you land on after going through three gaps will break under the force of your free-fall and let you go even farther down, even if you crash-land on something deadly. It has quite a steep difficulty curve however continued practice will make you get better at it as you learn just how much to move your finger to get the perfect amount of distance. So…many…ads… and the developers know how much you hate advertisements so they will allow you to give them money to block the advertisements for things that they know you are not going to buy. This is an evil concept to use, but genius at the same time. The difficulty curve is more like a step. The first few levels are more like a tutorial and then it takes on a higher difficulty which stays pretty constant for most of the game. This makes things get repetitive rather fast. With fun visuals and engaging gameplay, Helix Jump will be a favorite among casual gamers. With over 50 million downloads to date, it is promising to become a standard among casual mobile gamers. The developers’ aggressive marketing campaign on Instagram probably has a lot to do with that. Helix Jump is a refreshing return to what mobile gaming is all about. All that casual players need is a simple puzzle with a clear goal in mind and color variation to keep things fresh. Tetris would be proud. Sometimes when playing Helix Jump, bluestacks ask you fee to pay but gives you option to download some apps. Every time it asks you just select “Install apps” and continue using it free. I hope you enjoyed this article, please rate and share. If you have problems running Helix Jump on your desktop or any other issues, leave a comment below.